Mythbusters is one of my favourite Discovery Channel series. In this show, common myths are supported or “busted” through scientific experiments. In one episode, the hosts tested the myth that a coin-drop from a tall building could kill a pedestrian walking at the ground level. This thought dropped on my head (pun intended) a few times as I live in Toronto and occasionally walk by our CN Tower. What did the Mythbuster crew find out? The halfway point of 2017 is fast approaching. For businesses who are impacted by the ELD mandate and are not yet compliant, research is important. There are a lot of myths being thrown around. Here is Part 1 to these myths. Myth: The Mandate Will Drive Owner/Operators Out of Business. Owner/operators are understandably concerned and upset over the change. After running trucks for many years, it is annoying to change operations. Other than the cost of buying devices, owner/operators are concerned about running on the regulated 11 hours. For some drivers, they were used to driving unreported overtime hours. A lot of these drivers are being paid by mileage and feel that there would not be enough money if they drive under regulated hours. Dave, a popular YouTuber, explains that it is true a lot of drivers are used to working 14-15 hours. However, when ELDs force these drivers to drive 11 hours, Dave is optimistic that shippers and companies will realize that their loads are going to take longer. He points out that truckers would then see an adjustment in their pay rate. Also, many drivers changed their opinion about ELDs once they experienced time and money savings. The biggest saving came from spending more time driving and less time drawing lines, calculating hours, and filing reports with paper logs. Another saving came from eliminating errors – sometimes from honest mistakes – which could cost in fines of up to $10K. Myth: The Government Has 24/7 Access to Driver Logs. ELDs can track drivers in real-time and can issue alerts to drivers when rules are violated. Some drivers are concerned – will the government be able to access these records and be notified if there is a violation? ELDs are not sent in real-time to the government. The data is saved and sent to a private portal. When does the government get access to these data? The government would get access in the same situation as if paper logs are being used. Data can be requested in a roadside inspection or in a compliance audit. Myth: ELDs Do Not Improve Safety. The official explanation is that ELDs improve safety by preventing drivers from driving overtime and cuts accidents caused by fatigue. Some drivers are skeptical. They feel that ELDs would make driving less safe. If drivers are used to working longer hours, wouldn’t that mean drivers will now rush and cause accidents? Remember, rushing and speeding leads to more speeding tickets! The FMCSA studied that ELDs will prevent 1,844 crashes a year. One might ask, is there any truth to these studies? It’s best to look at a real example. 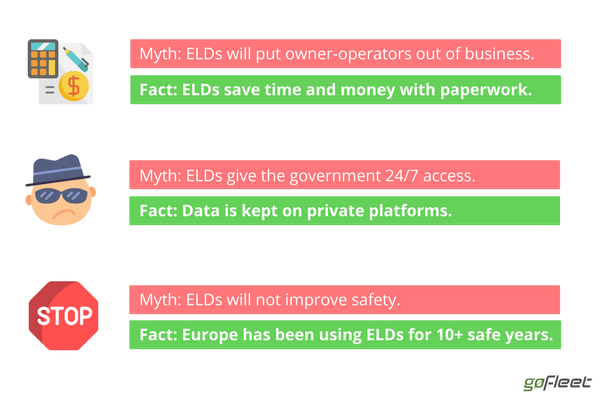 In Europe, there has been an ELD mandate since 2006. Europeans refer to ELDs as “tachographs” and have been doing fine for over a decade. In fact, the European Union is pleased enough with the results that it is planning to tighten ELD regulations. Join us next time as we share more Mythbuster clips and tackle more ELD myths. Also you can check out our complete guide to electronic logging devices.